Attention Barbie fans! Royal Caribbean International is partnering with Mattel to bring the fabulosity of Barbie, the world's most popular doll, to Royal Caribbean Cruise Ships. The pop culture icon will set sail on the high seas for the very first time, in January 2013. The all-new Barbie™ Premium Experience will be available exclusively on Royal Caribbean ships. Barbie will be making her stylish splash aboard the cruise line's global fleet of 22 ships in January 2013. The Barbie Experience will be made available on select ships initially and will then roll out to the remainder of the fleet by March 2013. "Barbie remains the most popular doll of all time and a powerhouse brand among girls of all ages," said Lisa Bauer, Senior Vice President, Global Sales and Marketing, Royal Caribbean International. "She is everywhere girls are today, so it only makes sense that girls can now find her at sea exclusively aboard Royal Caribbeans fleet of world-class ships." The partnership with Barbie will include a variety of activities in the cruise line's award-winning Adventure Ocean youth program and a Barbie™ Premium Experience. Girls participating in the cruise line's award-winning Adventure Ocean youth program can participate in the complimentary version of the Barbie program. The complimentary experience offers Barbie Movie Night, Barbie Story Time and other complimentary themed activities, plus Barbie movies on their stateroom televisions. The Barbie™ Premium Experience is the ultimate experience for Barbie enthusiasts! 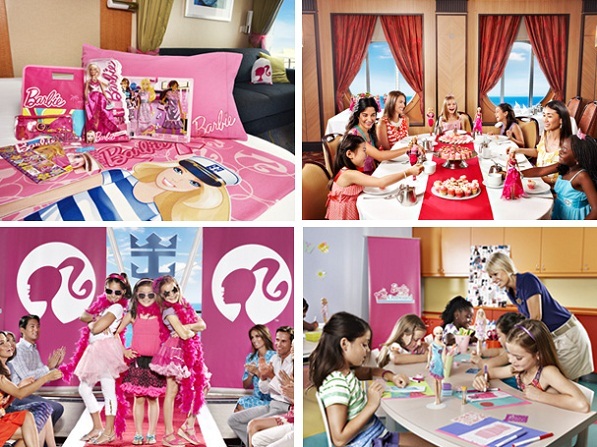 Girls will enjoy staterooms decorated in the iconic doll's signature style and will have the opportunity to participate in exclusive, themed activities throughout their cruise – from an invitation-only tea party and mermaid dance class to a fashion design workshop and Barbie Girls fashion show. 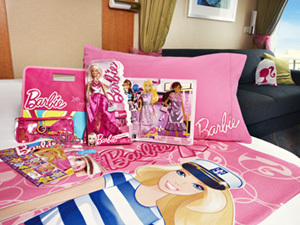 A Barbie stateroom, adorned in the doll's signature style and featuring keepsakes such as a Barbie® doll and fashions, blanket and pillowcase, tote bag, toothbrush and toiletries bag. From the moment they step into their staterooms, girls will be drawn into Barbie's distinct world of style – and of course, pink! Mermaid dance class where girls can shimmy and shake while learning the latest dance moves from the hit movie Barbie™ in a Mermaid Tale 2. "Barbie is truly a lifestyle brand that is part of a girl's world from her bedroom to playroom, computer to closet," said Lori Pantel, Vice President Barbie Global Marketing. "We're excited to extend that brand experience to family cruise vacations with a fantastic partner – Royal Caribbean."